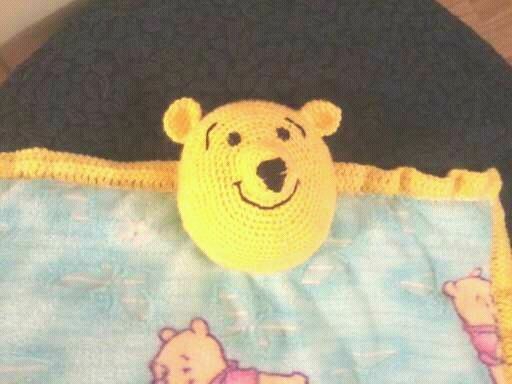 I searched for a Winnie the Pooh pattern, and when I finally did find one, THEY WANTED $50 JUST FOR THE PATTERN!!!!! So I said, OK, I’ll make it up myself! And I did. This was made for one of my granddaughters. I came out well if I do say so! I simply took some flannelette material, crocheted around the outer edge, and made a head and arms and legs by looking at a picture in a coloring book.